A Key Biscayne development team on June 5 announced a new luxury boutique residential project designed to appeal to the Latin American market and locals already living on the coveted island. Called “101” for its convenient, maintenance- free location at 101 Sunrise Dr., the five-story building will have 11 spacious residences in a variety of two-, three- and three bedrooms + den configurations. “Our new project offers an exceptional year-round Key Biscayne lifestyle,” said developer Eric Soulavy, a local resident who leads the REAC development team. Designed by Key Biscayne architect Gabriel Lopez, 101 is a “smart” building that features advanced technology, including electric plug-ins for hybrid cars and electric golf carts, as well as amenities like a rooftop deck with lap pool, barbecue and yoga center. Priced from $1.73 million to $2.2 million, the residences at 101 feature luxurious Ornare kitchens with optional upgrades, Miele appliances, spacious exterior terraces, high ceilings, impact-resistant windows and doors, and contemporary, cutting- edge design. Groundbreaking is scheduled for September with completion expected in December 2014. “Key Biscayne is an ideal location for U.S. and international buyers seeking a welcoming and secure multicultural family community,” Soulavy said. Soulavy notes that 101’s low-maintenance condominium lifestyle allows buyers to enjoy their residences year round, or leave for several months without having to worry about maintaining the home, lawn or pool. A doorman welcomes guests and monitors the building, which includes a locker room for residents’ luggage, bicycles, paddleboats and other items. Each unit has two parking spaces. “Our residents can enjoy secure beach access,” Soulavy said. “We also created an oversized amenity deck on the rooftop terrace with a 25-meter, twolane lap pool, as well as a barbecue area for relaxing with family and friends day or night.” Buyers can customize their 101 residences from five different layouts depending on their individual needs. The units range in size from 1,865 to 1,949 square feet under air. Sales and marketing consultant Thania Vernon, a long-time resident of Key Biscayne, added: “There is no new inventory on the island in this size and price range with 101’s building technology and safety features. 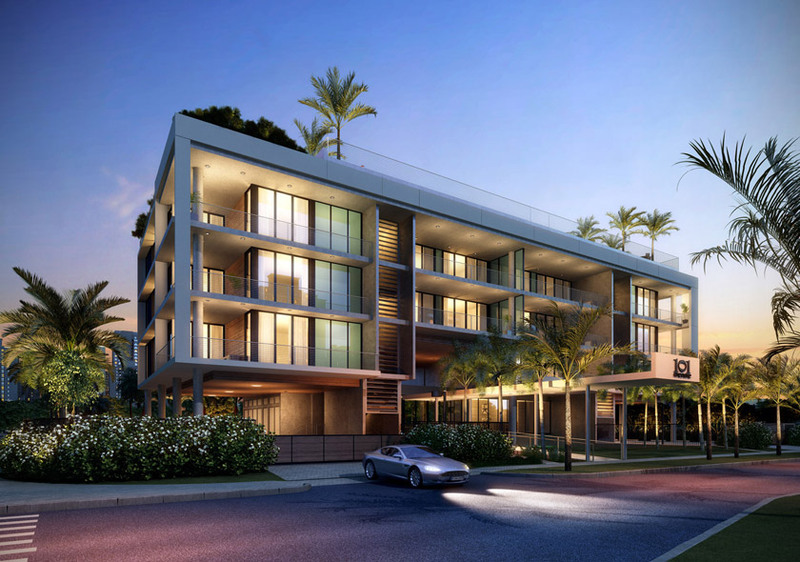 Given the limited opportunity for new condominiums of this caliber and price point, we believe there will be extraordinary interest in the project.” The development’s sales center is located at 240 Crandon Blvd., Suite 250, in Key Biscayne.